At the start of 2014 I had pretty much never read a blog unless I’d stumbled upon one accidentally, I had no idea that there were these lovely online communities of people who share their every day waffle with each other, I was half way through my maternity leave and, actually, I was struggling. 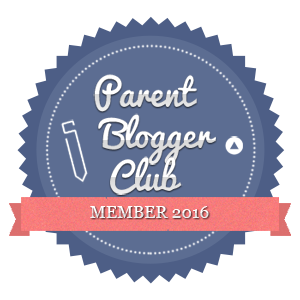 At the start of 2015, I am an actual blogger, I know what widgets, Tots100, linky’s and sticky posts are (the last one I’m less sure of! ), I feel comforted by a group of wonderful parents online, I am fully back at work and tired beyond belief, but I am happy and motivated. I have a great big diary (a lush, gorgeous 100 year diary) that I fill in every few months as a reflection anyway so I suppose this post is just the online, sharing version of the end of year entry. And let’s face it, there’s only one way that I could break this down to review – blogging life, teaching life and mama life! I have had had a blast since I set this blog up in April by finding out many weird and wonderful things from fellow bloggers. Being part of a parenting community. I was the first of my friends to have a baby and was totally bewildered and unsure, I love that every day I get online and share my stories and read other people’s stories of parenting highs and lows. It most definitely gives me comfort to know that I’m not the only one winging it! Almost 10,000 views, almost 500 twitter followers and a new love of Instagram…I’d never even been on it this time last year. 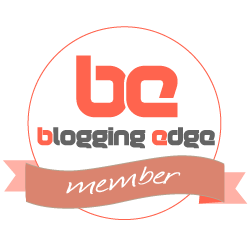 Increasing my audience was something that stressed me out for quite a while once I realised that I quite enjoyed blogging. Once I found some linky’s and got involved in the social media side of things though, that soon came. I’ve not always found it easy to post original or interesting content. I work full time. And that’s not just 9-5 full time, that’s teacher full time which is close to 60 hours a week, if not more as well as looking after Sprog. Honestly, just going back to work and being ‘me’ again. I loved being off with Sprog and a much more leisurely lifestyle but I felt like my brain was rotting. Going back to work has been amazing for me. The social time with colleagues has given me space to be ‘me’ again and to relax. Surviving. There has been an awful lot of challenges. Tiredness. Complete lack of time. Being too emotionally invested in students. But the great big positive in all of that is that I am surviving and just about managing to stay on top of all of my spinning plates. Lack of time to do anything. I am constantly up against a lack of time to do all my planning, marking, phone calls home, interventions with students, revision sessions, trip planning, meetings with colleagues, moderation of exam work, CPD programmes and it can feel one feeling a little inadequate no matter how hard you are trying. Missing my little Sprog like mad. I’ve actually had a really tough term with some of my GCSE students who have admitted that they don’t like History, they don’t know why they choose it, and their behaviour and effort has therefore been…difficult. So so many that I don’t know where to begin. I suppose the key thing is just the genuine joy and happiness that Sprog brings to my life, my husband’s life and to everyone else he meets. He is honestly the most smiley and cheeky little man going and luckily (or not) for him, he has inherited my great big gobby grin! 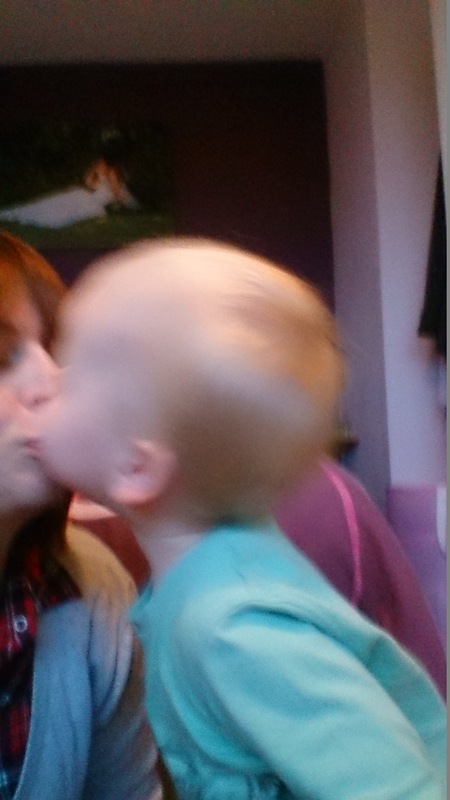 He is kissy, huggy, smiley, loving, angelic (I would only guarantee this whilst he’s asleep though), monsterous and amazing! He just makes my heart melt. Too soppy?! So how about the days out that we’ve had together – a summer and a winter trip to London, an epic adventure to America, days out at the farm, trips to the library and great baby activities. O, and making my loving group of Mummy friends! I will just pick two things as we all know that this parenting gig is no easy one. In the last year, I have left a whole range of emotions. Far beyond what I have felt before. There were really low times – this time last year I was really struggling to feel ok, to want to get going and I actually felt quite useless as a Mama. But I’ve also experienced incredible highs like when Sprog took his first steps and I’ve never cried at so many happy things! The rollercoaster of emotion is one of the toughest and best things about being a parent. Secondly, the utter, unrelenting and constant tiredness. Enough said. I hope that when you sit back and reflect upon 2014 that no matter what chaos the universe has thrown at you, you can see positives and that as you plan for 2015, which we inevitably all do, you can look forward with anticipation and eagerness. My plans involve shedding the remaining Mama tum… eek, and actually just remembering to enjoy my family as much as I possibly can. It’s been lovely ‘meeting’ everyone this year and all that remains is for me to wish you all a fantastic New Year and a wicked 2015. P.S. 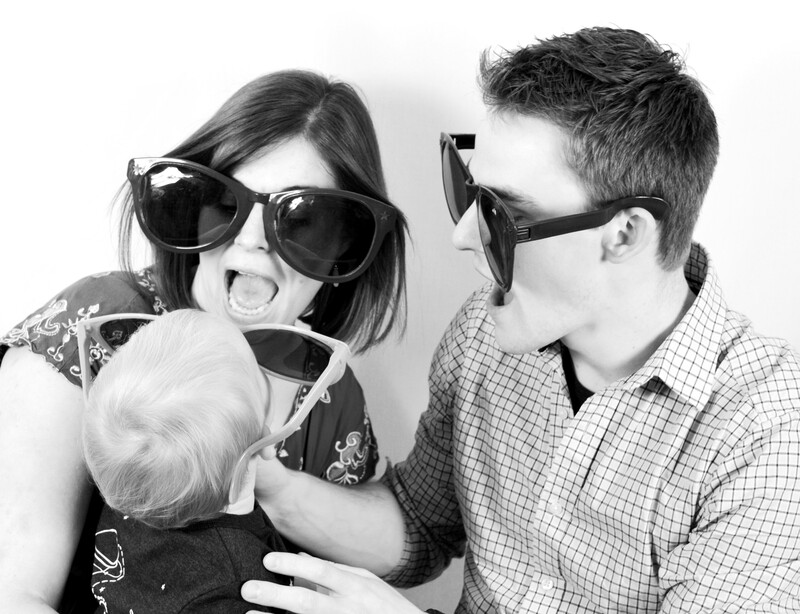 If you’re stuck for ideas for NYE with a toddler, I came up with a few this week! 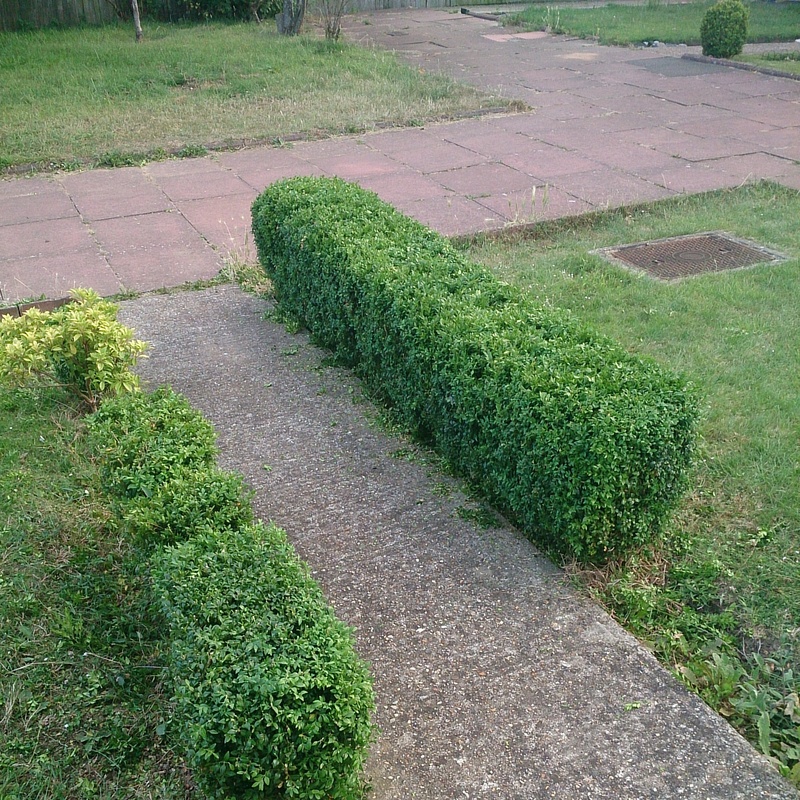 Our freshly trimmed hedges. It was a good bit of team work from hubby and I.
I think this is the most productive and efficient weekend that hubby and I have had in a very long time. This time of year is a special time for us teacher folk… 6 weeks of freedom looms ahead with many social engagements filling the calendar and the potential for so much to get done around the house and just to make things “better” ready for September when we know that our feet won’t touch the floor until Christmas! It sounds like a long time but 6 weeks whizzes by (I apologise now to anyone who does not have the luxury of a summer break, I will not argue the merits of staff and students needing a break so you’ll have to trust me when I say that everyone is exhausted!). This year will go even quicker than normal as life with sprog is a whirlwind. After some quality time with him over the weekend, I am so excited about seeing my little man so much! He’ll still be doing his 2 days a week at nursery which should give me the time I need to start preparing for September (I normally work for between a week and 2 weeks towards the end but this year I will not sacrifice any sprog time for work so I need to be more organised). In preparation for this, I have been compiling lists – there’s a work ‘to do’ list and a home ‘to do’ list. Hubby and I spent over 30 minutes trawling through the whole house during nap time with a pen and some paper and created a huge list – there’s over 50 jobs on there! I’ve even created a nifty (yes…nifty) spread sheet to help me organise and prioritise the jobs. Some are cleaning, some are fixing, some are tidying, some are painting, some are DIY-ing, some are buying and installing new things… my favourite is the last one. I am excellent at creating lists of things which need doing… 6 months a go I bought a black board for the kitchen and wrote a list… we haven’t done any of the things yet. As the summer holidays approach though, the pace of life changes and we should get more done. We even plan to use the evening time after sprog is asleep to do some tasks. Mama highlight – Sprog is now fully walking independently, he can make it across the lounge and made it half way down the aisle at church today. He has also had really teething pains the last couple of days and whilst I would do anything to relive his pain, the cuddles that I have had have been absolutely beautiful and have reminded me that although he is already becoming independent, he will always want his mummy when he’s not well. Teacher highlight – I marked all of my year 10 assessments this week within 2 days of them sitting them, quite an achievement let me tell you. The most exciting news came from a national competition which I entered some students into saying that their work has been shortlisted for the top 35 entries (see here for more information). Me highlight – I’ve had very little time for myself but I feel that the week has been a good week. As I lay here typing my thoughts out, I am happy and contented. We have managed to achieve something’s around the house, I have braved going into town on my own with sprog with just the sling (no backup buggy) for a good few hours, I feel loved by two amazing boys and there’s only 8 teaching days until the summer holidays!